That right there is all WWG texture! I'm not actively working on this... yet... but I have a bunch of ideas. I'll post pictures on my blog if/when I do more toying with it. I still have a slew of kitbashes to finish up for submission, so I can't let myself get too distracted by this. I like what you did with the top and bottom edges. 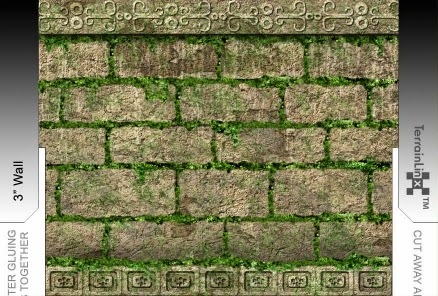 To get the moss on there, did you just mess with layer masks to allow some of a moss layer to come through onto the wall layer? I was just playing around, so I didn't bother trying to make a layer of nothing but moss texture. I could have done that and used a layer mask, too. Kinda six of one, half dozen of the other. First thing I did was grab a chunk of the tree texture from Swampwood Village. That's the "moss" I'm using. Then, I cloned it over itself a bunch to cover up some of the areas that were mostly just dark. Then I fiddled with the colors - brought the saturation and brightness down, and changed the hue a little. So, now I've got a little rectangle of moss texture. Then, I grabbed a feathered brush and drew roughly along the brick edges. I made it wide enough to give me something to pay with. I just did one row of bricks, then copied and pasted that, adjusting stuff as necessary so it lined up with the bricks. Then I went back over it with an eraser to make the edges a little wonkier, and I cloned yet more moss hanging in places and what not. Fiddle fiddle fiddle. Then, I grabbed a brush that kind of speckles stuff. I cloned using it onto a new layer, covering the whole thing pretty well. Using the same brush, I erased here and there so it wasn't overwhelming the picture. And, I dropped the opacity down a bit. The most fun was finally using paths in GIMP in order to stroke the curly pattern that became the bump map up top. You just keep getting better and better at this stuff, Michael. p.s. 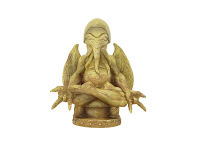 that "pretty cool statue from Akshardham Temple in Delhi" in your blog is just begging to be modified to or replaced with Cthulhu! I don't own all of the older sets... is there any Cthulu-esque statue that might work here? IIRC Denny once mentioned he'd like to do something Cthulhu based at some stage, however I don't think that idea ever made it into a set.